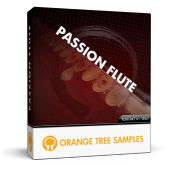 Over a year in development, Orange Tree Samples is proud to announce the release of our latest sample library, Passion Flute. This extensive library puts you in control of an ultra-realistic Jazz-Rock flute. Whether you need an energetic flute solo or an emotive, rich lead for a melodic ballad, Passion Flute is capable of a wide range of expression.